Know about pregnancy myths and facts and basic tips of taking a newborn. 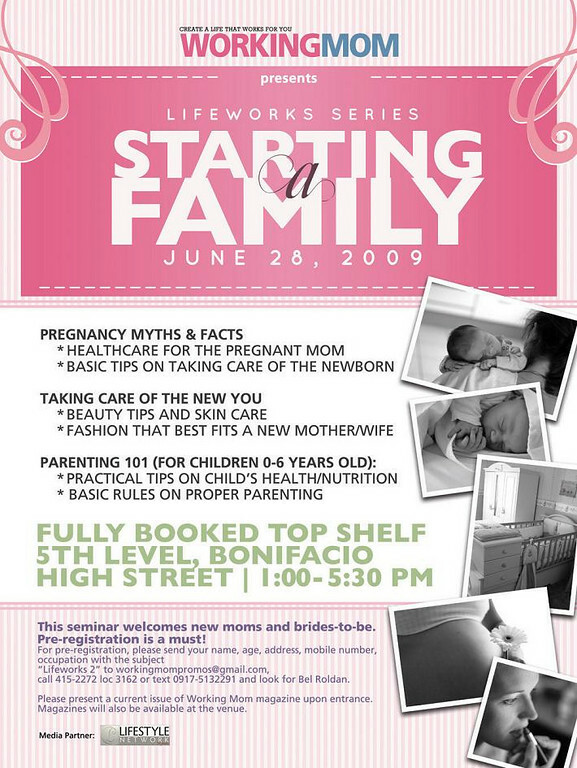 Learn about how to take care of yourself, and the fashion that best fits a new mother. Learn tips on how to parent children 0-6 years old, practical tips for their health and nutrition and the basic rules on proper parenting. Attend Working Mom's Starting A Family Seminar at Fully Booked Top Shelf, 5th level, Bonifacio High Street from 1:00 - 5:30 PM on June 28, 2009. Pre-registration is a must so click on the picture for details.